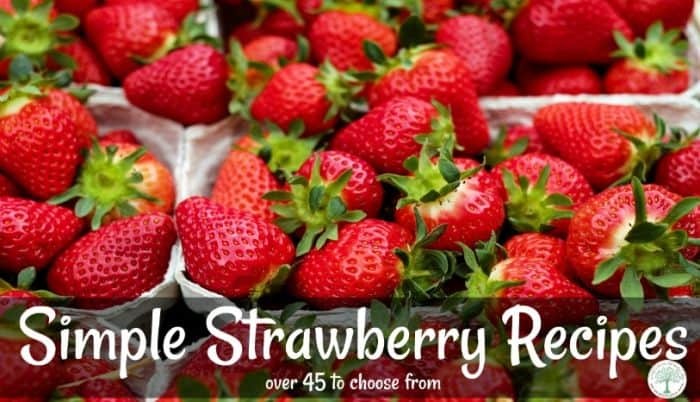 The humble strawberry boasts an amazing amount of Vitamin C (139% of the RDA) with only 49 calories per cup. It’s low glycemic, making it a perfect food for just about anyone. They can be eaten raw, in smoothies, salads, ice cream or in cakes and pies. Simple strawberry recipes that feature the red jewel are some of the best, right? They lend themselves equally to be in sweet or savory dishes and are easy to find year round, although the price is generally lower when they are in full season. hey are often in season from late February through June each year, depending on where you live. There are plenty of ways to enjoy strawberries later in the season. You can preserve the juicy jems for later enjoyment by freezing, dehydrating or canning. To learn how to can strawberries, read the post here. Strawberries only last fresh a short time, so enjoying them quickly in some simple strawberry recipes is the best option. So, how to keep your strawberries fresh? fill a large bowl with cool water and add 1/4 cup of white vinegar. Swirl the berries in the vinegar water for about 10 minutes to help kill off any mold spores that are on them. This will help extend their “shelf life” by a couple of days. Rinse carefully, then allow to air dry. Normally you would want to store them on the counter at room temperature, but I often will store mine in the fridge to help extend their life. Here are over 45 delicious ways to enjoy these sweet berries in this Ultimate Simple Strawberry Recipes Collection! What are some of your favorite simple strawberry recipes? Which one will you try first? Be sure to pin this for later! I love strawberries!! They are my absolute favorite berry besides elderberries. We love strawberries!! I have a strawberry jam recipe posted on my blog that my family loves and I made a strawberry lime slush the other day, it was amazing!! Yum, so many goodies for spring! I’m hoping to can up some strawberry jam. Fantastic list! Strawberries are my favorite fruit and I love finding new ways to incorporate them into recipes. Love this list…great! 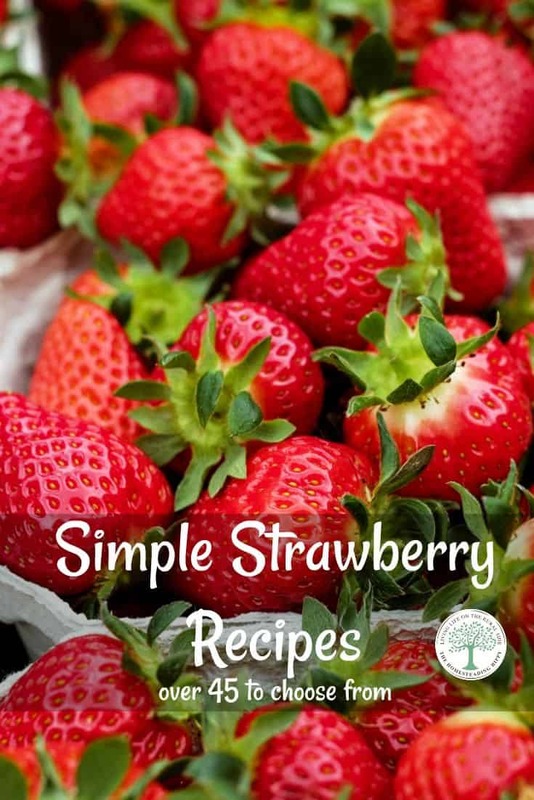 What a great resource when looking for strawberry recipes…thanks for sharing! Oh my! This is my one stop place for strawberry recipes. I cannot wait to get my strawberry fix this spring. Thanks for all of the recipes and ideas. What a great list! Thank you for sharing, I had no idea that I could use vinegar to preserve the life of my strawberries by a couple of days. I keep meaning to paint some rocks to stop the birds from getting too them. Might have to add that to my to-do list for this week. Thanks for the great list, I can see myself referencing it often.